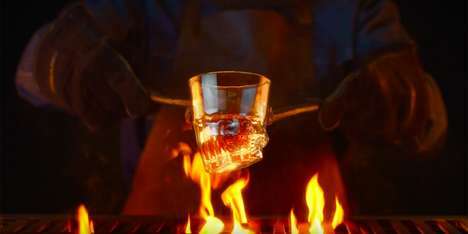 Outside of the burgers that it serves on a daily basis, Burger King has experimented with creating a range of flame-grilled goods for promotional purposes and in France, it is now creating over a million unique drinking glasses over the fire. For a limited time, Burger King will be giving out its “flame-grilled glasses” with Cheese and Bacon Whopper meals. Naturally, the drinking glasses are anything but perfectly shaped, as each one melts a little differently when exposed to intense heat. Burger King France teamed up with tableware company ARC to create a total of 1,519,229 unique drinking glasses for this promotion, which are expected to become sought-after Burger King collectibles, as only a limited number of the unconventionally shaped glassware products will be available for a short time this year.